Born on March 2, 1902, Gracie Peterson discovered her passion for music as a young girl. At age 17, Gracie began taking piano lessons from Edna Browning Riggs at the Monmouth College Conservatory of Music. The following year, Gracie enrolled at the conservatory to study under Riggs, completing her degree in 1922. Following her graduation, Peterson went on to teach at the college, completing her nearly fifty-year career in 1971. Following her retirement, Gracie became increasingly engaged with the community of Monmouth, entertaining citizens at her famous "Gracie Shows" at the Rivoli Theatre, along with her weekly performances at the Monmouth Rotary Club meetings, and at Meling's restaurant, until her death in 2006. 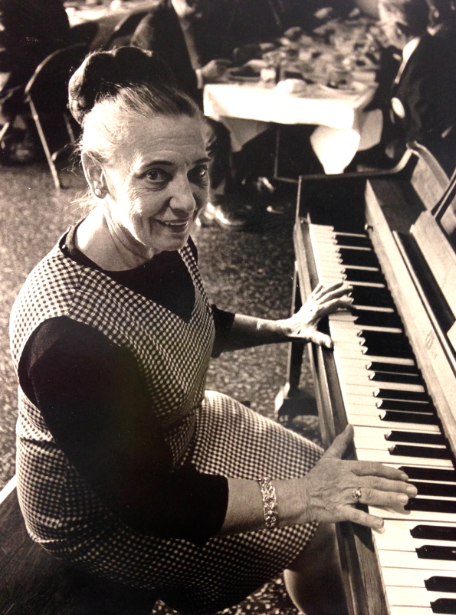 One of the most celebrated Monmouth College alumni and faculty members, Gracie Peterson lived a life dedicated to creating music and sharing it with others. This dedication to sharing her music allowed her to build a sense of community between Monmouth College and the city of Monmouth, where she lived and performed for nearly a century. Because of her long career and service, the Wells Theatre Plaza was named in her honor in 1990, and shortly after, the college also dedicated a dormitory in her name. Although the plaza and dormitory remain as physical reminders of Gracie's impact on Monmouth, her music, which will live on in the hearts of Monmouth citizens, remains her legacy.